It is hard to believe that there was a time, not long ago, when there was no right to obtain government information, no protection against hazards in children's toys and other consumer products, no federal safety standards for motor vehicles, and no insurance to protect an investors' money and securities in brokerage accounts. These and other consumer rights were created only after fierce political battles in the decade between 1966 and 1976. People's Warrior is the untold story of that era and one of its towering leaders, Congressman John Moss. 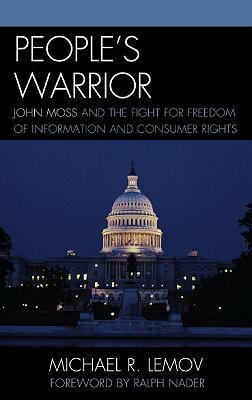 Based on previously undisclosed materials and interviews, People's Warrior tells the story of a stormy decade in America, in which the Freedom of Information Act and the Consumer Product Safety Act were enacted by Congress, despite overwhelming political opposition. Moss fought for twelve years, against three presidents and at times his own party, for a freedom of information law that has stood the test of time and been copied around the world. Although at first stymied by special interests, Moss won sweeping consumer protection reforms and went on to challenge Wall Street in an intense battle to enact major new investor protection laws. What happened to Moss and his progressive agenda in later decades, and what the future may bring for that agenda, make up the final part of this compelling story of a man and an era. Michael R. Lemov served as chief counsel to John Moss for eight years. He was General Counsel of the National Commission on Product Safety. He is author of the Consumer Product Safety Commission Regulatory Manual and numerous articles about John Moss. He was recently named by the governor of Maryland to the state’s Consumer Advisory Council. The book is also available through Amazon, Borders, Barnes and Noble and other book sellers.